All About the Outfit (and life...): Hey all! This is a quick post just to say hey and wish you a happy spring with this floral number from Bernie Dexter (or I suppose, "happy autumn" if you're in the southern hemisphere). I'm actually shocked that only today is the first day of spring, as it's felt like summer here the past week (80 degrees). I've discovered that my new pool is a complete mob scene on hot weekend days! I wasn't intending to use the pool this weekend, but my Internet was out and my pool has wifi, so I used this first world problem to my advantage for an hour or so each weekend day ;) Next weekend, if the weather holds up, I may have friends over so at least I now know to get there early!! Style Details: One of the reasons why I love this dress is because virtually every color is in it! I decided to be liberal in choosing a color scheme and went for pinks and reds to highlight this fact. 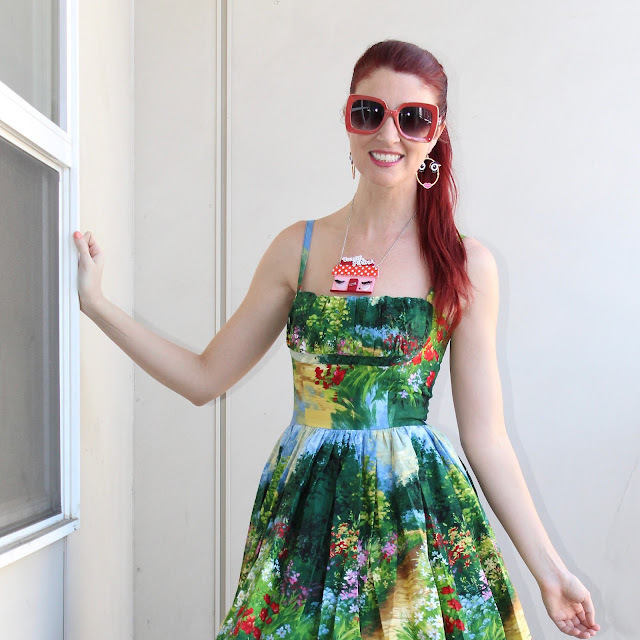 Bernie Dexter has some similar landscape/floral print dresses out there, fair, but this one may be my favorite yet. The details are insane and again, the fact that is has all the colors is one of it's best features. (See a similar print from Bernie HERE from 2016's first day of spring). True, the dress has every color in it, how cool is that? I loved the dress! And I reeeeeally loved the necklace, so cute! You look super beautiful and the shoes are the perfect complement to the outfit! I do hope you can use the pool soon, and yes, spring has arrived! Yay! Hope you have a great day!